Following the death of Brother Emerson Wilson, Brother Roger Decker answered the call to become the pastor of the Church of God at God's Acres in May of 1987. 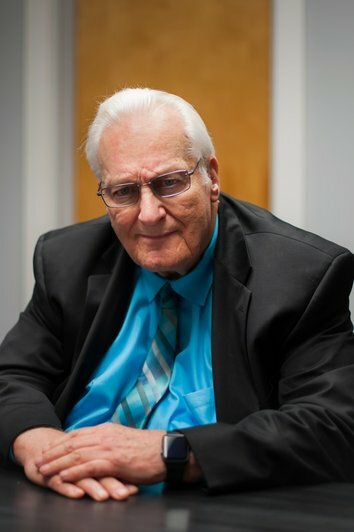 He and his late wife, Sister Roxanna Decker (parents of 5 children, 24 grandchildren, and 19 great-grandchildren) served the Lord together for over 45 years, having been a great help and inspiration to the local congregation. (Sister Decker went on to meet her eternal reward in October of 2016, leaving behind a spiritual legacy for both her family and the congregation. The December 2016 issue of The Gospel Trumpeter (page 6) features an article in her remembrance. If you wish to read how God delivered Brother Decker from gambling, feel free to view the article that was featured in our local newspaper and his personal testimony. - On Sunday, May 20, 2007, the local congregation honored Brother and Sister Decker for twenty years of pastorship. Click here to see a slideshow of snapshots that were taken at this event. - On Sunday, May 20, 2012, the local congregation held a Pastor Appreciation Day, honoring Brother and Sister Decker for twenty-five years of pastorship. Click here to view a slideshow of snapshots that were taken at this event. If you would like to know about the history of the Newark congregation, feel free to visit our history page.